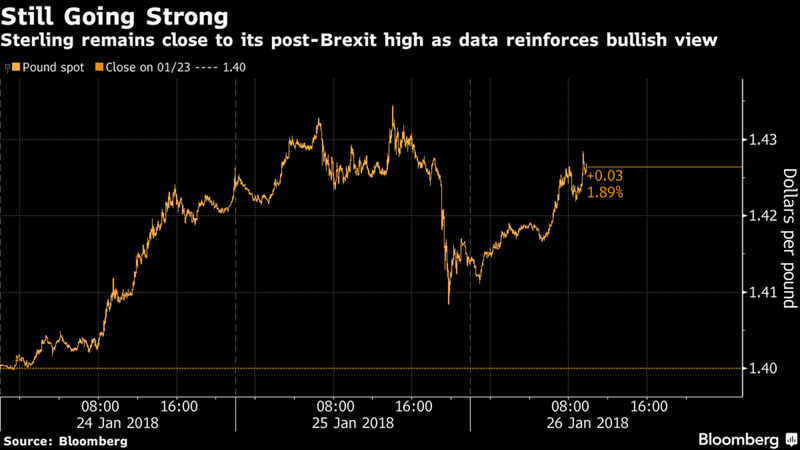 The pound headed for the biggest weekly gain in more than four months after the U.K. economy expanded more than forecast. The currency advanced for a fourth day in five as gross domestic produce rose 0.5 percent in the three months ended December, faster than the 0.4 percent median estimate in a Bloomberg survey. The currency has surged this month, boosted by a weaker dollar and hopes that the U.K. government increasingly favors a soft Brexit. The pound traded 0.8 percent stronger at $1.4256 as of 9:46 a.m. in London after gaining as much 1 percent soon after the GDP data. It has advanced 2.9 percent this week, headed for the biggest five-day gain since September. The yield on U.K. 10-year government bonds fell one basis point to 1.41 percent. As investors grow more confident that the U.K. economy will hold up despite Brexit, market positioning has shifted to bet on further pound strength. CFTC data released earlier this week showed leveraged funds raised their long positions on the pound to the highest since August 2015.